We try to make sense of the world by dividing it into manageable zones, isolating effects one from the others and then reconnecting them--a rational, or at least habitual, process. In visual terms, we can see what is in front of us but not behind us, though it is possible to turn around and somehow link the two, diverted though we may be as we turn. We may see and think and feel at the same time, perhaps in widely varying categories that are nonetheless related. Experience is continuous, the world is continuous, because consciousness would make them so, but they are also disparate, full of disjunctions that are continuously being accounted for, or not. "To most people, reality is a confirmation of their expectation. Art can present an alternative to what people think they see or to what they expect to see," Alfred Leslie said in an interview about his grisaille portraits of the early 1960s. Art has the job of revealing everything at once, what might otherwise be too painful or too beautiful to see. 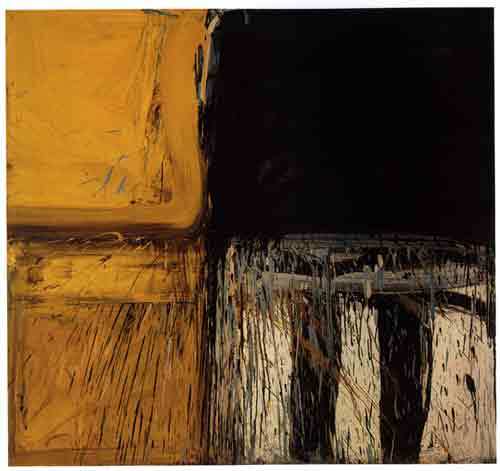 And so it is with Leslie's early work, from 1951, when he was 24, into 1962, as it would remain with the figurative work he began to focus on in the latter year. 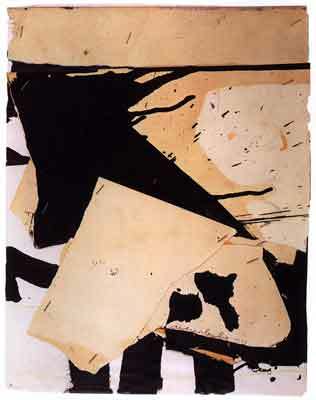 The first three years are represented in this exhibition by small painting-collages in which torn and cut shapes of black and white painted paper are stapled to a surface that is already painted with splatters and configurations like the vertical bars that are a constant motif in all this early work. 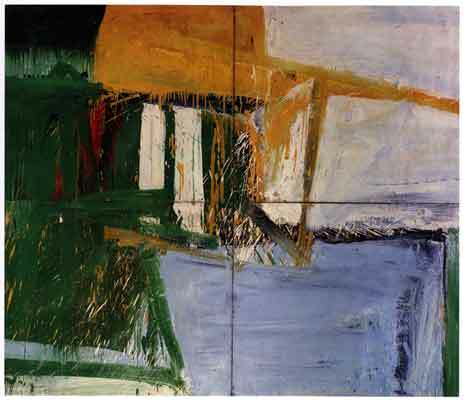 The picture plane is appropriated even more insistently and literally than in the work of his older Abstract Expressionist contemporaries. As much as the shapes order, they disorder, clashing with one another, partly covering up what is underneath, leaving raw spaces where their rough edges almost conjoin. The rectangle of the picture is powerfully gripped in structure, precisely because nothing fits neatly together; everything intrudes on everything else, laterally and in depth. The paper or canvas is always barely big enough to encompass the contents of its boundaries. Not that everything is there, which might be expressed either as a black hole or a blinding light, but that there is some kind of balance, both precarious and ineluctable, between the two. What makes its way to the surface is inevitably piecemeal--strokes, splatters, and drips of paint pushed around in various ways; shapes that expand beyond their geometry; colors, brilliant and evocative as they might be, that abjure purity. Yet each creates a single totality in which the elements are bound to one another and cannot be separated. 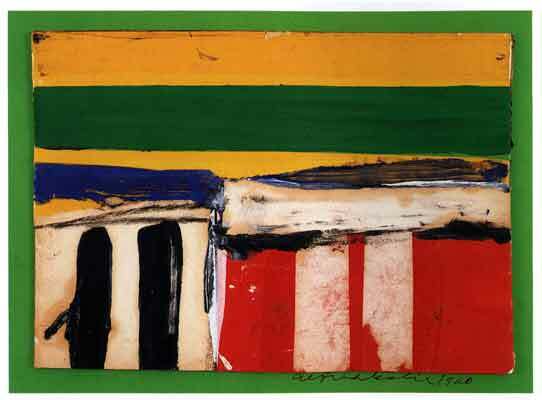 The act of painting (or collaging), of moving paint and shapes and colors, is everywhere evident, as the force that pulls everything together. Yellow 3rd, 1958. Oil on canvas, 60" x 66"
Many of the works, large and small, are configured in quadrants, as though to satisfy the four sides of the rectangle, the four sides being taken as points of view, just as the figures in the later portraits combine face-on perspectives at four different levels. In Yellow Third, the quadrants partake of the shape of the canvas, but they also more aggressively interpenetrate and claim the canvas, the black by extending downward in columns to the bottom border and leftward through the yellow to the left border. The yellow splatters and drips into the right lower quadrant as the black does into the left lower quadrant. The work is alive, it breathes, the shapes jostle and fill out the space. Blue appears underneath at the interstices of black and yellow and yellow and yellow, but it is hard to know how extensive the blue might be; it also appears dripping into the lower right quadrant. There is no end of questions and speculations about what is going on, though one immediately accepts the structure that is given. It is like a mathematical formula that one has elegantly arrived at through experience. Several paintings are literally in quadrants, four canvases joined in a grid. Each of these is one picture, but we are compelled to notice that there are four units, which are read as both separate and connected. They are pictures of becoming, in which the beginning is also the end. Any one of the four in Quartet #1 might be admired individually, but it would be like considering only one of the four corners of the earth without even knowing about the other three. The upper left quadrant is an intense combination of dark green, blue, yellow, and white. The upper right is predominantly a field of white, with tints of blue and red and the yellow shape attenuated into it. One of the yellow arms extends down through the white into the light blue field of the lower right, which in turn pushes into the green of the lower left, which connects finally with the green of the upper left and is sprinkled with drips from the yellow shape there. This implies a constant circularity when in fact the forces are more evidently upward, downward, and lateral. So the circularity is figurative, for the time it exists, or the time we are paying attention to it. But it is as real as the cycles of days and nights. All of Leslie's large paintings of this period seem to reflect the forces of nature, of growth, movement, and evolution, of atmosphere, light, and reflection, of storm and calm. And they appear in the colors of nature, especially in greens, browns, blues, yellows, whites, and blacks, all inflected with other colors. In his smaller works, which also use oil-based paint as well as collage on board, the colors are deliberately flat in effect and not naturalistic, without the transparency, depth, and mixing that occurs in the larger paintings. But that is what is wanted, or at least referred to, that the colors balance against one another in a clear pattern without interference--modernist exercises in pure color relationships and retention of the picture plane. But it can't be just that, and it isn't. One of them has two compartments at the bottom with vertical black bars on a white field next to vertical white bars on a red field, then horizontal swipes of white and blue above them, then yellow, a green band, and a yellow band horizontally across the top half. But nothing is pure. The green and yellow bands at the top are almost straight-edged, though the green seems to dip slightly to the right. Otherwise, the red and black have white in them, the white has red in it, and the yellow shows beneath the brushstroke of the blue. The shapes are only nascently geometric, and the vertical white bars seem to slide under the black above them. These bars suggest a kind of human or architectural presence, as the horizontal bands suggest a horizon. The border is a different kind of green, signalling an unexpected universe within which this arrangement exists. Once again, as with the larger oil paintings, it is impossible to banish suggestiveness and to keep out the complexity of vision and experience. In the November issue of ARTnews, Robert Ayers correctly assesses Alfred Leslie's stature as an artist and his importance to the history of contemporary American art. Untitled, 1960. Mixed media and collage on board, 7" x 10 1/8"
The exhibition was shown at Allan Stone Gallery, 113 East 90th Street, New York, NY 10128.